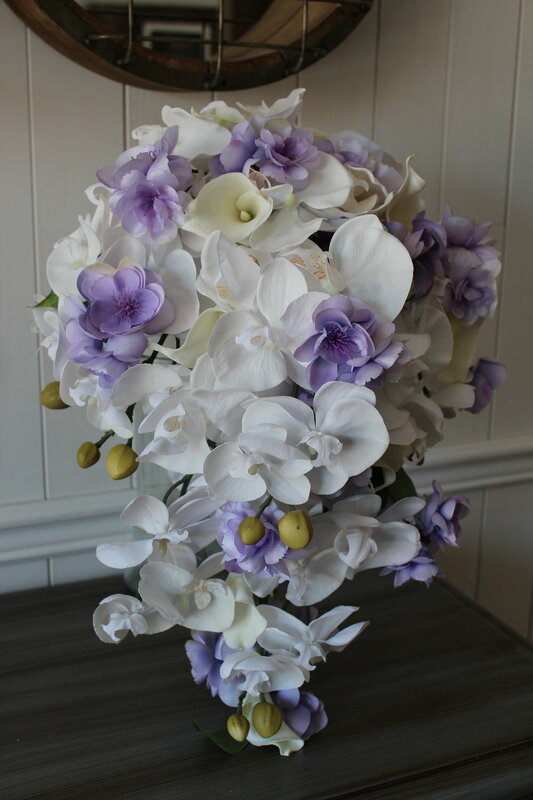 Take a look at this pretty bouquet that was a silk wedding recreation for a bride from Staten Island, New York. This recreation consisted of ivory Roses, white Stock, and blue Gypsophilia (Baby's Breath) finished off with a beautiful Antique White ribbon that fits right between the ivory and white flowers. 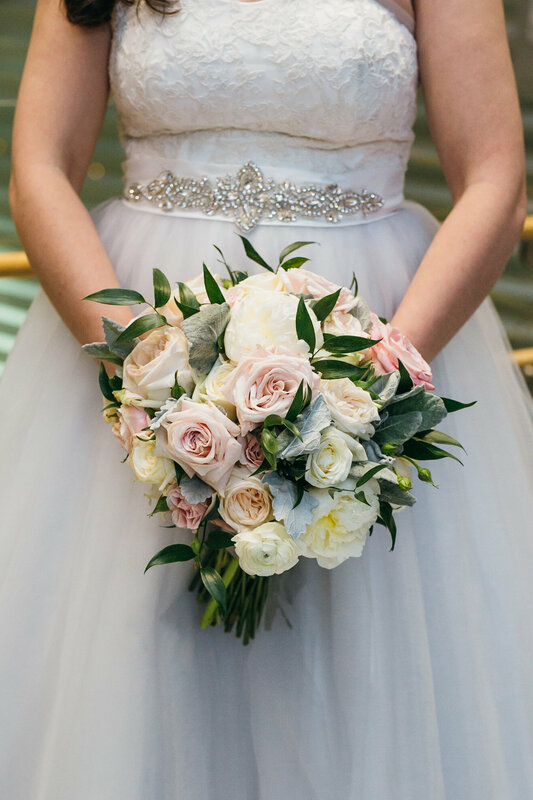 Maria, chose to not have the gems added into her bouquet, but as you can see from this beautiful photo provided by Express It Video & Photography that her recreation is still amazing and really captures the design and beauty of her original bridal bouquet. 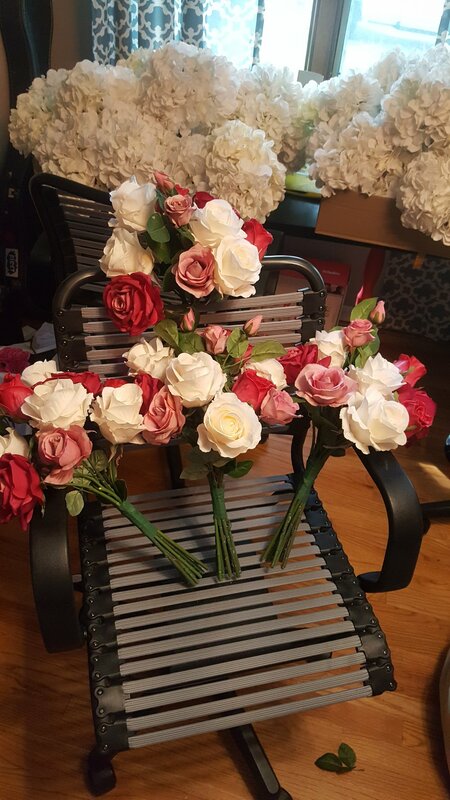 Maria also sent me a photo after she received her bridal bouquet recreation in silk flowers. She had saved the rhinestones from her wedding day and was able to add them back in herself. Take a look! 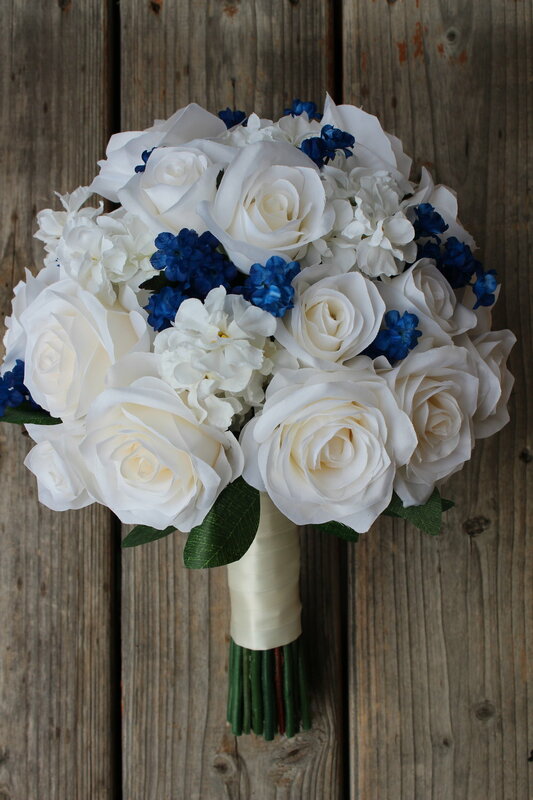 If you are looking for a recreation or love the look of a neutral and navy bouquet, contact me for a free quote! It might be obvious that what I do is fun, but every once in a while it's a little...extra. When I get a bride who gives me some freedom to come up with something special, it's a fun challenge for me. Liz is one of those brides. Her sister Katherine had the same adventurous spirit when it came to her wedding flowers. Sounds like a fun family to be a part of! This stunning, cascading bouquet has blush Peonies, light and dark mauve fresh touch Roses, ivory Roses, Baby's breath, mauve Thistle, Seeded Eucalyptus and Dusty Miller. I tied it off with a beautiful mauve satin ribbon to finish the look. The textures are so interesting and the color combo is just gorgeous! The bridesmaid bouquets had some of the same flowers as the bridal, but a different shape. They also had the blush Peonies, ivory Roses, dark mauve Roses, Baby's Breath, Seeded Eucalyptus and Dusty Miller. It still had lots of fun texture and color, but the bridal bouquet had those few extra elements to set it apart. I wrapped the bridesmaid and toss bouquets in a blush pink satin ribbon for an elegant touch. One of the bridesmaid bouquets with the cute little toss bouquet. The toss included ivory Roses, a single dark mauve Rose, Seeded Eucalyptus and that beautiful mauve satin ribbon. The boutonnieres and corsages used mauve and ivory roses with various greenery and smaller accent flowers to bring in more of the colors. If you want to see more weddings that incorporated mauve, check out these blog posts! If you have a general idea but are looking for ways to jazz up a basic plan, I'm the one you need to talk to! Whether it's bringing more color to your flowers, adding unique textures or finding ways to set apart your wedding flowers, I've got ideas. Contact me to get started! This beautiful silk flower bridal bouquet is simply stunning. With hot pink and blush Peonies, ivory roses, and magenta Tulips it has all the summer wedding vibes the bride was looking for. She also requested some broaches tucked in there. Five medium broaches and 6 small broaches added a ton of shine in the bouquet. And if that wasn't enough, we added on that beautiful bejeweled sleeve to cover up the stems. Here's a peek at one of the bridesmaid bouquets with the bridal. You can see I added in some small rhinestones into the bridesmaids bouquets. It gives them a little somethin' somethin' without taking anything away from the bridal bouquet. Bridesmaid Bouquet: Ivory Roses, hot pink and blush Peonies, ivory Phalaenopsis Orchids, Greenery. Maybe you've got an even more creative way to include some shiny things into your flowers but don't know how to pull it off. I'm your gal! Drop me a line and let's see how we can make it happen! I've done some really fun bling in silk wedding bouquets lately. In fact I'll have another post next week, so be sure to check back! Sometimes I use bling for a subtle bit of glamour, while other times I seriously up the shimmer game. Wherever you fall on the shine continuum, there is bling for you! 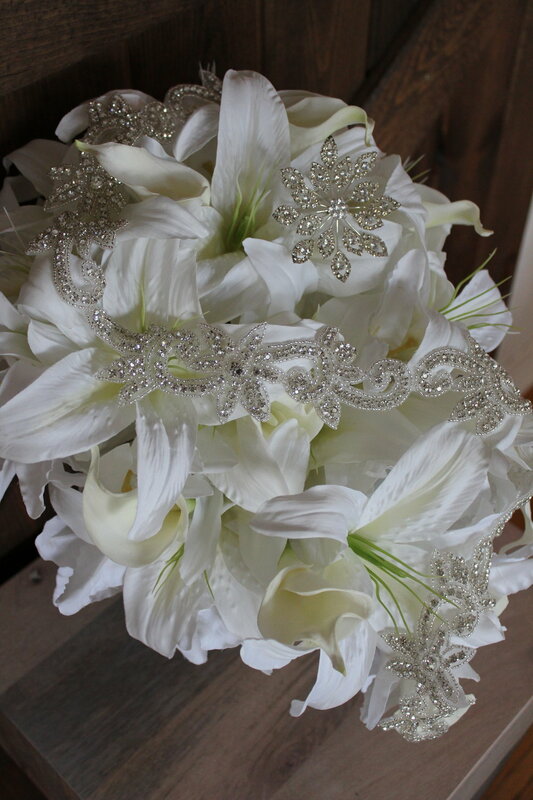 Click this link to see a list of other ways bling as appeared in our silk wedding flower bouquets. Take a look at a local bride's beautiful cascading silk flower bridal bouquet with ivory Phalaenopsis Orchids and fuchsia Roses--it's a triple whammy of bling! Whammy #1: Rhinestones sprinkled throughout the bouquet. Whammy #2: A statement broach placed in the bouquet. Whammy #3: Bejeweled sleeve for the handle of the bouquet. It's breathtaking! This baby had some serious shine. 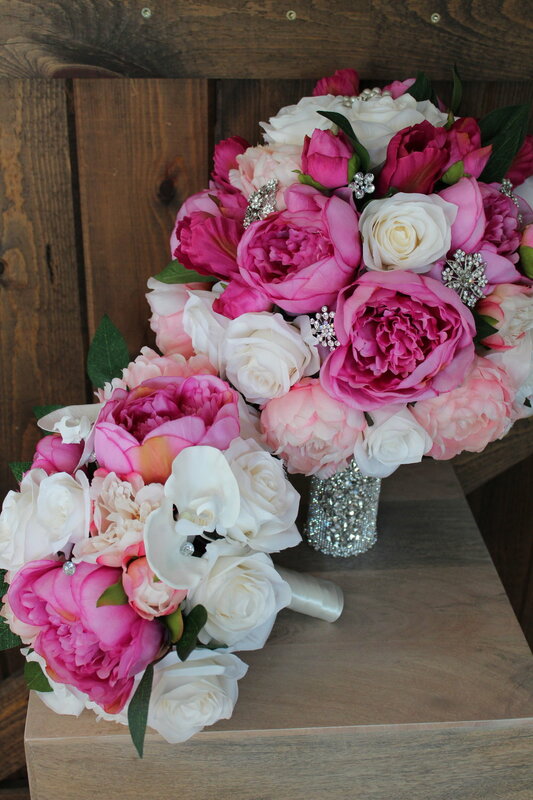 If you're looking for creative ways to incorporate bling into your silk wedding flower bouquets, contact me today to get the design process started. 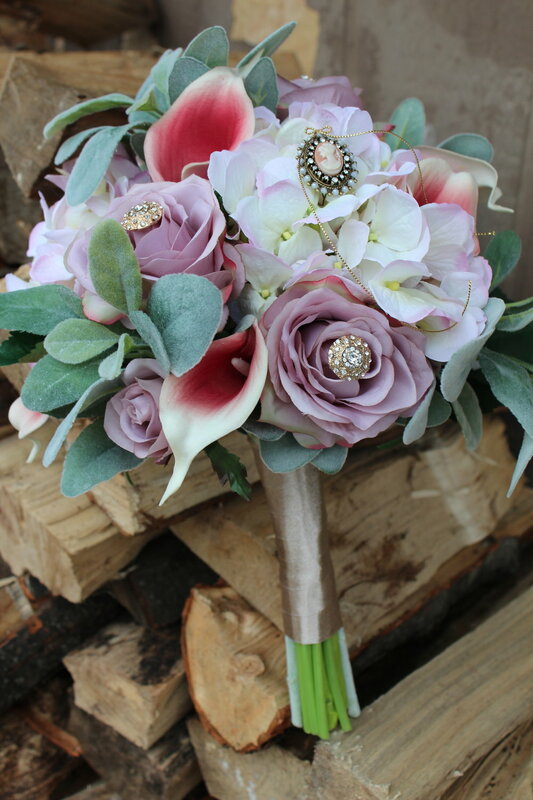 Check back tomorrow to see more beautifully blingy silk wedding flower bouquets! White and pink clusters going in Mercury Mason Jars and bud vases on the guest tables. These pretty little clusters will adorn a beautiful draped backdrop for behind the bride and groom's table. If you're looking for more information about bridal bouquet recreations in silk flowers, I've got a few posts in the works, so check back soon! You might remember Katherine's gorgeous cream, ivory and white silk wedding flowers from last month. Here's the fun part...the big reveal! Take a look at these lovely images that Katherine sent me this week, provided by the very talented Traci Krzyzanowski Photography. Check out her website to see more of her work. The bridesmaid dresses are a great compliment to such a classic color palette. Aren't they all so beautiful! Katherine's off the shoulder look is both on trend and timeless-she's gorgeous! 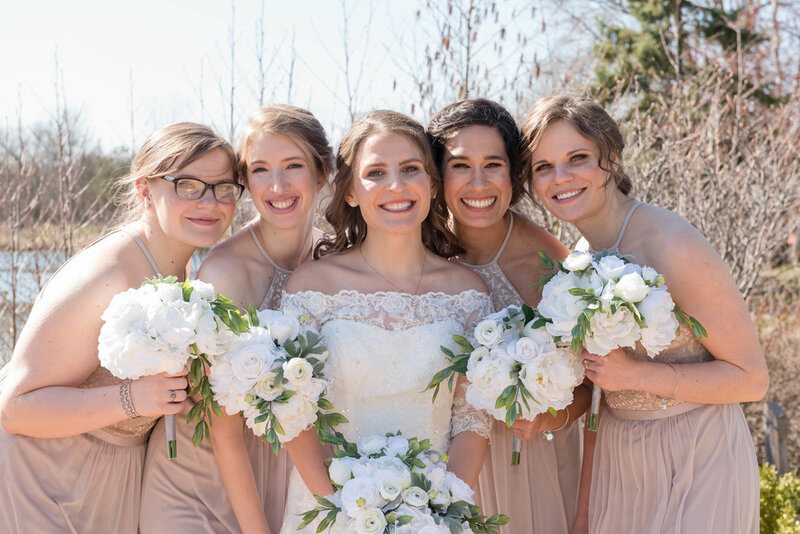 If you hope to have some happy smiles on your big day, just like Katherine and her bridesmaids, contact me for a free quote! Tracy contacted me for her mid-May backyard wedding just a couple of months ago. At the time I was imagining lovely spring weather for my own backyard. But it's hard to imagine seeing grass, let alone having a wedding outside since we had 22 INCHES of snow last week (whatever, I'm over it). Luckily, I was just finishing up her flowers and these bright and fresh colors brought a lot of joy to my time spent on the inside; 2 days of a blizzard and then a day off of school makes it feel a little confined! Take a look at Tracy's backyard beauties! The bridal bouquet is a mix of red, coral and ivory Peonies and Ranunculus. Because this backyard wedding is in California, I chose a brighter shade for her greens to give it a fresh West Coast vibe. The Matron of Honor bouquet matches the bridal bouquet with the red, coral and ivory Peonies and Ranunculus. Same greens and same red ribbon make for a great set! I don't typically include a photo like this in my blog posts, but I thought it might be a good idea to show you how your flowers will come if you order boutonnieres and corsages. Each personal flower is labeled and pinned, so all you have to do is recruit a trustworthy friend or family member to hand out to the recipients. Whether you are planning a big backyard wedding or maybe just a handful of special friends and family are celebrating you, custom silk wedding flowers are a great option. You get to be a part of the design process, receive pictures of your flowers in progress and see that you're getting exactly what you dreamed of. Thanks again to Tracy for allowing me to be a part of your big day! If you are looking for more ideas for on unique color palettes check out this article about Your Go-To Color Palettes' For a Perfect Wedding. April Snow Showers bring May Silk Wedding Flowers! May is always a popular month to get married. Things feel fresh and bright and it's the start of something new. There are tons of color options for May silk wedding flowers and really anything goes! From the pinks and purples, to coral and red (check back next week to see that lovely color combo), to a classic blue and white like Mary and Jason's flowers. As a friend of the bride and groom, it was fun to talk with them about their long anticipated wedding. Having been together for over a decade, they were more than ready to make their plans become a reality. Mary has had her dress for a while and she wanted her flowers to complement the blue accents on her bridal gown. I found some pretty blue Hydrangea, dark blue Roses, and we added in some white Calla Lilies (these fresh touch Callas are the best!) and tied it off with some silver ribbon. Her bridesmaids will carry a smaller version of Mary's bouquet and the toss bouquet is a simple clutch of blue Hydrangea and white Callas. I left some greenery and added some berries for a fresh from the garden look. 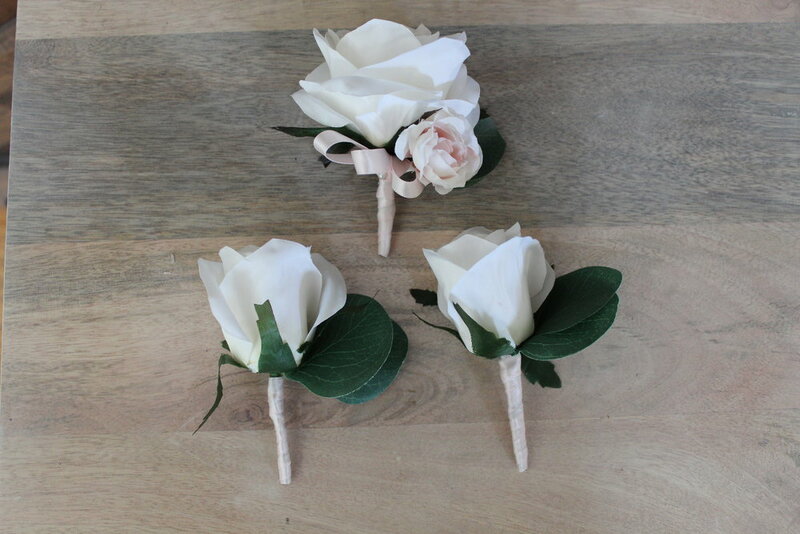 The boutonnieres and corsages in the same high quality silk flowers were a perfect match to the bouquets. Creating wedding flowers is a special job because it's helping a couple celebrate one of the happiest days of their lives. It's even better when you're doing it for friends! Thanks Jason and Mary for asking me to be a part of such a special day! 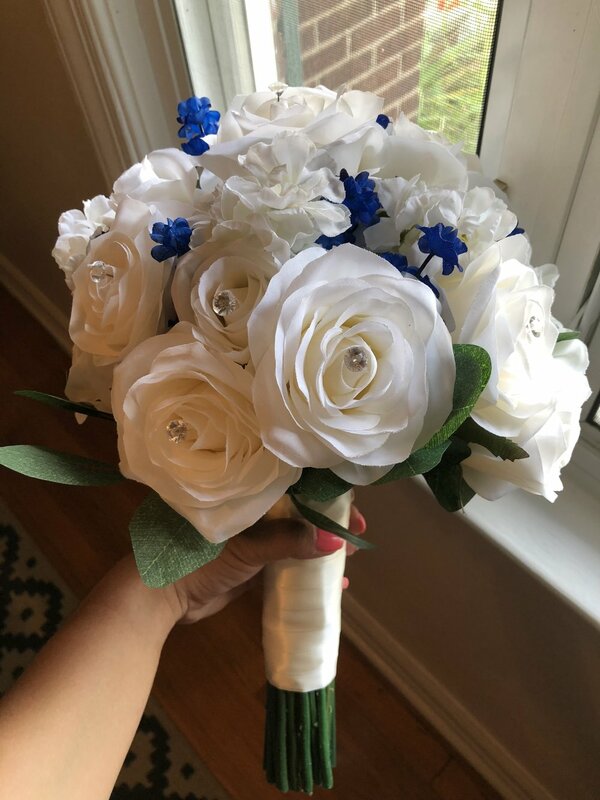 If you are looking for custom silk wedding flowers on a budget, fill out the Free Bride's Checklist today for a free quote! The combination of cream, ivory and white wedding flowers is a much less common choice these days. Just a few years ago, many brides were opting for bold and bright colors. More recently the blush tones are in high demand. So when I get a bride who wants a more traditional color palette, I get excited about the chance to put a new spin on a timeless look. That's what we did for Katherine's flowers. She sent me some inspiration pictures of cream, ivory and white flowers with some greens and we got started designing! 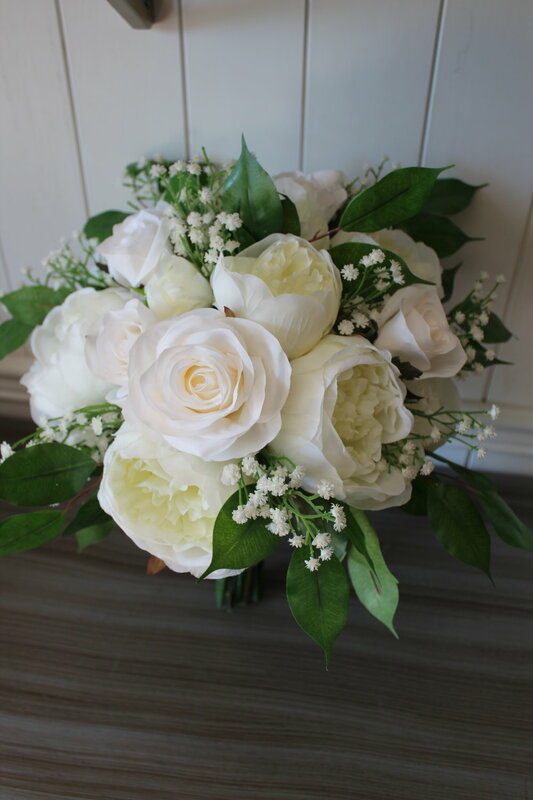 Take a look at Katherine's lush, garden inspired bouquets in cream, ivory and white flowers. For the bridesmaid bouquet, we just paired back the size of the bouquet and didn't include quite as much greenery. The cute little toss bouquet. A mother's pin on corsage, a pink Rose boutonniere for the groom to honor his late mother and an ivory rose boutonniere for the rest of the guys. 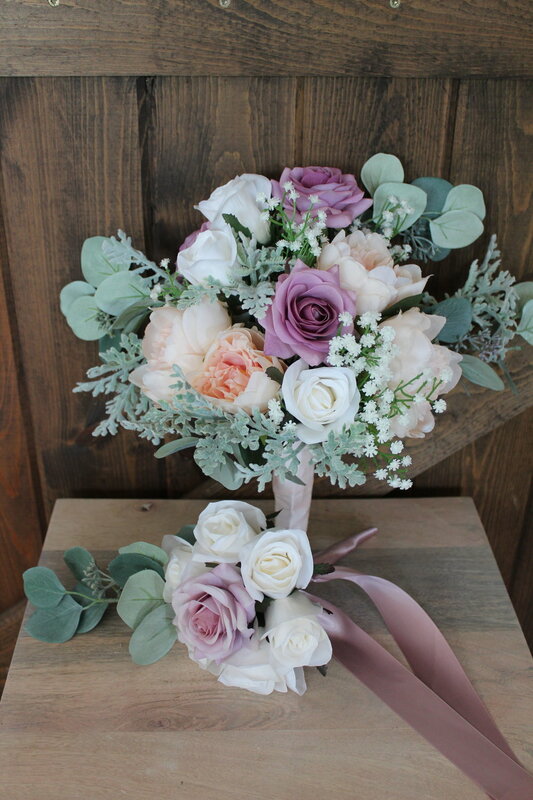 If you are considering a more traditional color palette for your silk wedding flowers, contact me today to see how we can make a unique design for your wedding day. Well it's still winter here, but I hear that in other parts of the world it's actually pretty warm. Hard to imagine right? Maybe not if you are a Floridian, but fellow Northerners feel my pain. Well let me give you a little something to inspire you for spring, summer or your next cruise! LaPriece contacted me over email, then her fiance' contacted me via phone, then we all got on the phone together and had a fun chat about silk flowers for their upcoming cruise ship destination wedding. 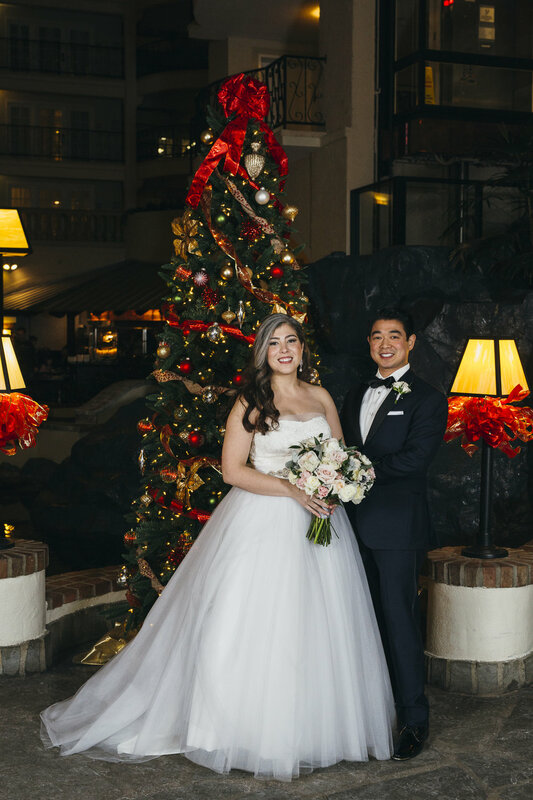 LaPriece knew she didn't want a traditional white or ivory bouquet, she was all about adding color, texture and a more modern take on greenery. She had some concerns about how to get the bouquet on the ship in one piece. I told her about some of my other destination wedding couples and methods we've used in the past for transporting flowers and keeping them in tact. After exchanging a few emails full of inspiration pictures, I came up with an original design for their big day. Take a look at this bright and happy bouquet and matching groom's boutonniere. SO many beautiful flowers and colors! Ranunculus, Roses, Hydrangea, Snowball bush, Peonies, Queen Anne's Lace, Fern, Freesia and ivory ribbon to tie it all together. Have questions about how a cruise ship wedding or destination wedding would work with silk wedding flowers, send me an email today and let's talk! Thanks again to LaPriece for a chance to look forward to sunnier skies and warmer days ahead! A mauve Rose, burgundy Ranunculus, and a touch of Queen Anne's lace and fern make for an awesome groom's boutonniere. Finished product shots are really fun to take and to show. 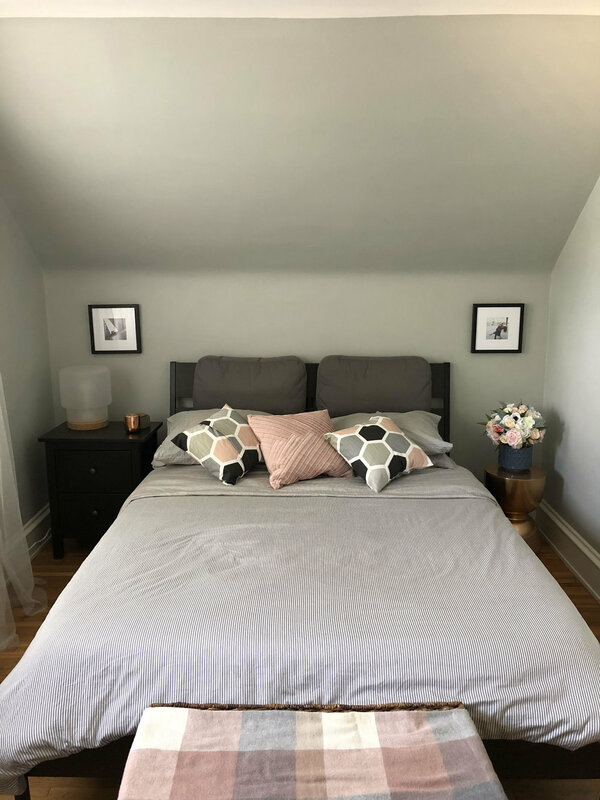 I get to see the process from start to finish: from inspiration board/photos, to a pile of flowers in my studio, to construction, finishing touches, and final photos. We added in some gold buttons with rhinestone details along side the broach; a good complement without taking away from such a unique piece. The groom's boutonniere was a single mauve rose with some lamb's ear tucked behind and wrapped in the same ribbon as the bouquet. If you're curious about silk wedding flowers, send in the Free Bride's Checklist and get a quote back lickety-split!